Adalay, Lawrence of Berkley and I went to the Dossin Great Lakes Museum on Belle Isle on the second day of this new year attempting to stay away from the cold temperatures and brutal winds of the coldest Saturday of this winter so far. The museum was very interesting but didn't provide much in photos without using a tripod and macro lens. I'd opted not to bring the small tripod today so I was stuck with only a few options for shooting. This was the only image I liked. 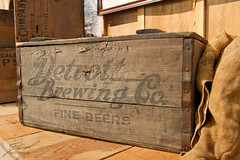 I have a thing for these old crates.